Washington D.C. Mayor: 'Redskins' Is RACIST ... 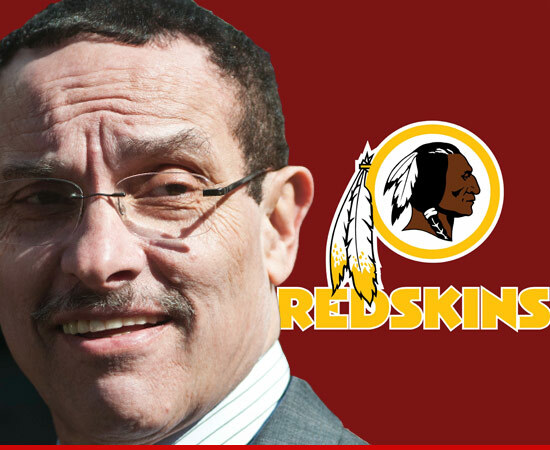 It's Time for a ChangeIt's damn time the Washington Redskins changed its racist name ... at least if the team ever plans to move inside D.C. city limits--so says District mayor Vincent Gray. Now that the Redskins are winning again, there's been a lot of talk about bringing the team back to D.C.--instead of leaving them in nearby FedEx Field, located in Maryland. But Mayor Gray has some conditions before the Redskins move a muscle--claiming, “I think that if they get serious with the team coming back to Washington, there’s no doubt there’s going to have to be a discussion about [changing the team name]." Gray added, “I think it has become a lightning rod, and I would love to be able to sit down with the team … and see if a change should be made. There’s a precedent for this, and I think there needs to be a dispassionate discussion about this, and do the right thing.”D.C. Mayor and Columnist Ponder Redskins Name After Playoff LossMeanwhile, a Washington Post columnist renewed his own call for a name change in a piece entitled "What's in a Name? The Redskins' Bad Karma." Courtland Milloy's provocative column is front-loaded with racial innuendo, beginning: "So, Washington football fans, how’s that offensive team name and demeaning sports mascot working out? Whooping and hollering as [quarterback Robert Griffin III] goes on a “Redskins” warpath only to leave a trail of tears when his wounded knee gets buried at FedEx Field." Milloy traces the "bad karma"--he wisely avoids using the word "curse"--to 1992, when Suzan Shown Harjo led a lawsuit (Harjo et al., v Pro Football, Inc.) that sought to change the name. Pulling no punches, Milloy, who is African American, asks, "Does anyone really believe that the name 'Redskins' will survive the 21st century? Other than the people who probably thought white actors in blackface would survive the 20th? The genocide of Native peoples, like America’s other original sin, slavery, cannot be forever masked with caricatures of the dead." Milloy points out the intentional irony in the NMAI's upcoming "Racist Stereotypes and Cultural Appropriation in American Sports" event on February 7.Katt Williams: Redskins Team Name Is SUPER Racist!!! Comment: It's good that the NMAI is tackling this subject in Washington DC. It seems like there's a groundswell of public discussion about the Redskins. Along with similar talk about the Atlanta Braves' retro batting cap. Perhaps these discussions can grow into a movement for changing the remaining mascots. I wonder if this groundswell is tied into all the recent controversies: No Doubt, Victoria's Secret, Johnny Depp, Elizabeth Warren, Idle No More, etc. Perhaps these incidents are raising the collective consciousness that 1) Indians still exist and 2) they don't like to be stereotyped. True, there's no clear connection between these controversies, but I claim they're connected. The connection is this: 1) Mainstream society claims Indian issues, along with Indians themselves, are trivial and don't matter. 2) Indians speak up, demand to be taken seriously, and mainstream society gets the message. Even if many people don't want to hear it. The Redskins name is really valuable, and really offensive. Here’s how to fix it. Rename the team the “Skins.” Plain old “Skins.” It is a bit of a nonsense word for a mascot, but then so is the name of the Cleveland Browns (named for first head coach Paul Brown), or the New York Knicks (technically short for Knickerbockers, but just see how many fans at Madison Square Garden can tell you what a knickerbocker is). Keep the burgundy and gold color scheme. Replace the face of an Indian chief on the helmet and logo with a picture of a football. Lose the Native American imagery altogether. I've lived in DC my entire life...naturally I am fervently loyal to all of our teams, but that doesn't blind me from seeing how dumb it is to have a racial mascot, and I must say I'm really disappointed in how many people around here are clinging to it as something sacred, and have the audacity to act offended by those who point out its racist nature. But I kinda like the idea of "the Skins" and wanted to add that it really wouldn't be such a nonsensical name...pigs have been a sort of unofficial secondary mascot of the redskins for a long time....we have a well known group of fans called the "Hogettes" who dress in drag and wear pig snouts, which itself is an old reference to the offensive line's nickname being "the hogs"....combine that with the old tradition of referring to a football as a "pigskin" and I think you'd have a recipe for a pretty badass looking hog mascot. This is refreshing, and goes against the trend seen in the deep "blue", leftist/liberal/Democrat leaders and areas which embrace the worst in sports mascots: Cleveland and Washington D.C.